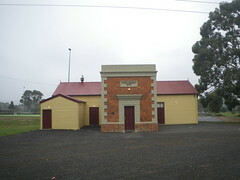 Wallan Wallan Free Library and Mechanics' Institute. Established on this site 1877. 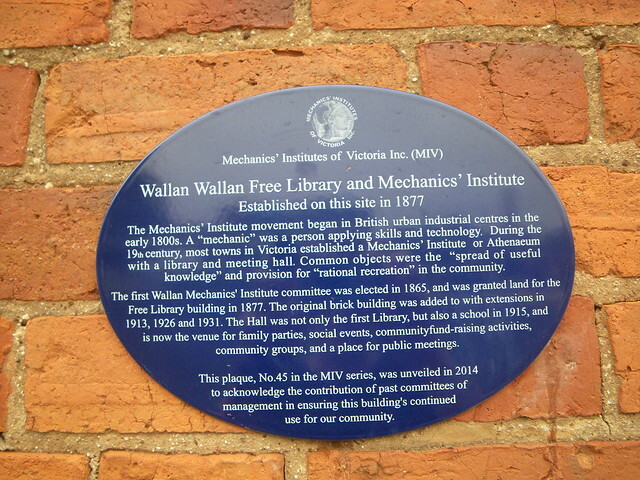 The Mechanics' Institute movement began in British urban industrial centres in the early 1800s. A "mechanic" was a person applying skills and technology. During the 19th century, most towns in Victoria established a Mechanics' Institute or Athenaeum with a library and meeting hall. Common objects were the "spread of useful knowledge" and provision for "rational recreation" in the community. The first Wallan Mechanics' Institute committee was elected in 1865, and was granted land for the Free Library building in 1877. The original brick building was added to with extensions in 1913, 1926 and 1931. The Hall was not only the first Library, but also a school in 1915, and is now the venue for family parties, social events, community fund-raising activities, community groups, and a place for public meetings. This plaque, No. 45 in the MIV series, was unveiled in 2014 to acknowledge the contribution of past committees of management in ensuring this building's continued use for our community.